Nowhere are the words art, history, mystery more applicable than the work of Northern Renaissance artist Hieronymous Bosch. In the second installment of BBC Two's Renaissance Revolution, Matthew Collings explores the enigmatic Netherlandish artist, with a focus on The Garden of Earthly Delights. This three panel (triptych) painting is housed at the Prado in Madrid. I think it is tremendously difficult to look at this work and understand what it would have felt like for a 16th century viewer to see it. 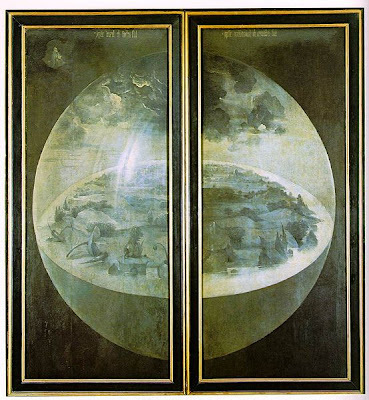 As modern observers, our frame of reference for Bosch's complex symbolism is predicated by our exposure to the work of 20th century surrealism. Unlike surreal or abstract artists however, Bosch was painting at a time when religion still pervaded daily life in a profound way. I quite liked Collings' approach to this work. 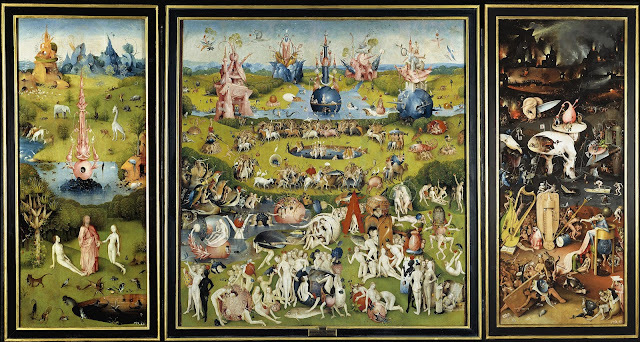 Factual details on this painting and Bosch are scant, but Collings lays out most of the known facts as well as acknowledges the biases we modern viewers have when looking at such a work. I particularly liked the link back to van Eyck's Ghent Altarpiece, which seems to be have been a great motivator for Bosch in creating this work. A lot of the intricate symbolism seen in the paintings is derived from Medieval motifs lifted from illuminated manuscripts, as well as folk tales, some of which have been long forgotten. One thing that was missing from the discussion perhaps was Bosch's influence on later artists, including Pieter Bruegel The Elder and leading up to the surrealists. A word to the wise - if you're thinking about leaving a comment complaining about Collings' musical selections...please don't. The art is the focus here! If you really must express your disdain at the score, contact the BBC directly! Fun post! I really like Bosch's work. Cheers M! One of your blog's archival gems I had missed! It's interesting how Bruegel's son went onto become infamous as a copier of his father's work where essentially his father started off doing the same thing to another artist! It shows the remarkable influence of Bosch's work. Fascinating! I like his reminder that we must look at Renaissance work as their modern art, because that's what it was. Also, I never knew that Bosch's tryptichs came out of a tradition of symbolic tryptich altar paintings. He referenced one artist but I didn't catch the name...very, very interesting. Hi Vicky!! Glad you enjoyed the program. The main inspiration Collings was describing was Jan Van Eyck's famous Ghent Altarpiece, another truly amazing and detailed work.